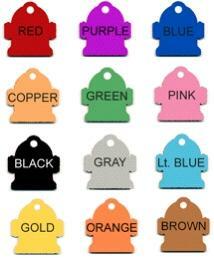 These tags are made of anodized aluminum. What does that mean for you? They will not rust or tarnish. Engraving comes through in silver ONLY. 12 Wonderful colors in most styles. All come with an attached jump ring at no extra charge, just to make the tag hang straight. Visit our Accessories section to order keyrings, key chains, or zipper clips to add uses to your selection. Great for sports bags, coats, key bobbles, dog tags, basket tags, even label your collectible bears! Click Here To View Colors Copper & Brown to be discontinued. Attention! We are experiencing issues with the pink in all tags styles. Our supplier has changed the shade of pink being used - it is now closer to a rose pink rather than a baby pink. We have expressed our concerns and the awareness ribbons will be reverted back to the baby pink, but they will not be changing the other shapes. We do apologize but this issue is out of our hands.